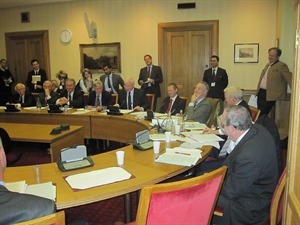 On 16th November, GSF held a seminar entitled: ‘The SDSR: Tough Choices For Tough Times – Are We Making The Right Decisions?’ which took place in the House of Lords under the co-chairmanship of the Rt Hon Michael Ancram and the Rt Hon Jack Straw MP. The speakers in two panels, entitled ‘Military Perspectives’ and ‘Political Perspectives’ were: Jonathan Clarke, Managing Partner, Washington Analysis and Assessment Service; Professor Michael Clarke, Director, Royal United Services Institute; Brian Hanrahan, BBC World Diplomatic Editor; Field Marshal the Lord Inge, Former Chief of the Defence Staff; Commodore Steven Jermy, former Strategy Director in the British Embassy, Kabul; Rt Hon Lord King, Former Defence Secretary; Phil Marker, Head, Conflict, Humanitarian and Security Department, DFID; Rear Admiral Alan Richards, Assistant Chief of Defence Staff (Strategy and Plans), MOD. Additional audience participants included Admiral Lord Alan West, Bernard Jenkin MP and Lord Lee. The seminar was extremely popular and a lively debate took place between the panellists, with additional time for audience Q&A. A summary of the main themes which emerged from the seminar is available by clicking below.